Post discussions on my performance at grad school and WHAT exactly DO I want to work in- I drew the following curves. Caution- Based upon a very ordinary understanding of extra ordinary technical things. The following is an excellent list of High Performance Computing using R.
This CRAN task view contains a list of packages, grouped by topic, that are useful for high-performance computing (HPC) with R. In this context, we are defining ‘high-performance computing’ rather loosely as just about anything related to pushing R a littler further: using compiled code, parallel computing (in both explicit and implicit modes), working with large objects as well as profiling. Suggestions and corrections by Achim Zeileis, Markus Schmidberger, Martin Morgan, Max Kuhn, Tomas Radivoyevitch, Jochen Knaus, Tobias Verbeke, Hao Yu, and David Roseberg are gratefully acknowledged. Several packages provide the communications layer required for parallel computing. The first package in this area was rpvm by Li and Rossini which uses the PVM (Parallel Virtual Machine) standard and libraries. rpvm is no longer actively maintained. In recent years, the alternative MPI (Message Passing Interface) standard has become the de facto standard in parallel computing. It is supported in R via the Rmpi by Yu. Rmpi package is mature yet actively maintained and offers access to numerous functions from the MPI API, as well as a number of R-specific extensions. Rmpi can be used with the LAM/MPI, MPICH / MPICH2, Open MPI, and Deino MPI implementations. It should be noted that LAM/MPI is now in maintenance mode, and new development is focussed on Open MPI. The papply package by Currie provided a subset of the Rmpi functionality, but is no longer actively maintained either. The biopara package by Lazar and Schoenfeld offers socket-based parallel execution with some support for load-balancing and fault-tolerance. The taskPR package by Samatova et al. builds on top of LAM/MPI and offers parallel execution of tasks. The Simple Parallel R INTerface (SPRINT) package by Hill et al. ( link , paper ) provides a prototype framework that allows the addition of parallelised functions to R for easy exploitation of HPC systems. Currently only a parallised correlation calculation is provided. The pnmath package by Tierney ( link ) uses the Open MP parallel processing directives of recent compilers (such gcc 4.2 or later) for implicit parallelism by replacing a number of internal R functions with replacements that can make use of multiple cores — without any explicit requests from the user. The alternate pnmath0 package offers the same functionality using Pthreads for environments in which the newer compilers are not available. 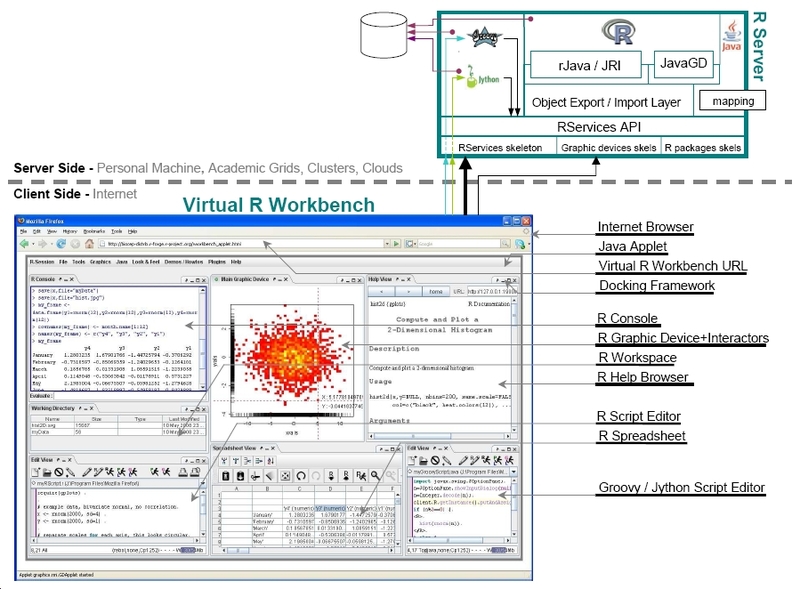 Similar functionality is expected to become integrated into R ‘eventually’. The romp package by Jamitzky was presented at useR! 2008 ( slides ) and offers another interface to Open MP using Fortran. The code is still pre-alpha and available from the Google Code project romp. An R-Forge project romp was initiated but there is no package, yet. The fork package by Warnes provides R-equivalents to low-level Unix system functions like fork, signal, wait, kill and exit in order to spawn sub-processes for parallel execution. The multicore package by Urbanek provides a way of running parallel computations in R on machines with multiple cores or CPUs. The RScaLAPACK package by Samatova et al. provides an interface to the ScaLAPACK libraries which can replace the standard BLAS libraries and offer parallel execution of the same BLAS functions. The SPRINT package by Hill adds another parallel framework to R ( link ). The mapReduce package by Brown provides a simple framework for parallel computations following the Google mapReduce approach. It provides a pure R implementation, a syntax following the mapReduce paper and a flexible and parallelizable back end. The GridR package by Wegener et al. can be used in a grid computing environment via a web service, via ssh or via Condor or Globus. Random-number generators for parallel computing are available via the rsprng package by Li, and the rlecuyer package by Sevcikova and Rossini. The Rsge package by Bode offers an interface to the Sun Grid Engine batch-queuing system. The Rlsf package by Smith et al. offers an interface to the LSF cluster/grid system. The caret package by Kuhn can use can use various frameworks (MPI, NWS etc) to parallelized cross-validation and bootstrap characterizations of predictive models. The multtest package by Pollard et al. can use snow, Rmpi or rpvm for resampling-based testing of multiple hypothesis. The maanova package by Wu can use snow and Rmpi for the analysis of micro-array experiments. The pvclust package by Suzuki and Shimodaira can use snow and Rmpi for hierarchical clustering via multiscale bootstraps; and the scaleboot package by Shimodaira can use pvclust, snow and Rmpi for computing approximately unbiased p-values via multiscale bootstraps. The varSelRF package by Diaz-Uriarte can use snow and Rmpi for parallelized use of variable selection via random forests; and the ADaCGH package by Diaz-Uriarte and Rueda can use Rmpi and papply for parallelized analysis of array CGH data. The bcp package by Erdman and Emerson for the bayesian analysis of change points, and the bigmemory package by Kane and Emerson can use nws for parallelized operations. The networksis package by Admiraal and Handcock can use rpvm and snow for parallelized simulation of bipartite graphs via sequential importance smapling. The BARD package by Altman for better automated redistring, the GAMBoost package by Binder for glm and gam model fitting via boosting using b-splines, the Geneland package by Estoup, Guillot and Santos for structure detection from multilocus genetic data, the Matching package by Sekhon for multivariate and propensity score matching, the STAR package by Pouzat for spike train analysis, the bnlearn package by Scutari for bayesian network structure learning, the latentnet package by Krivitsky and Handcock for latent position and cluster models, the lga package by Harrington for linear grouping analysis, the peperr package by Porelius and Binder for parallised estimation of prediction error, the orloca package by Fernandez-Palacin and Munoz-Marquez for operations research locational analysis, the rgenoud package by Mebane and Sekhon for genetic optimization using derivatives the affyPara package by Schmidberger, Vicedo and Mansmann for parallel normalization of Affymetrix microarrays, the puma package by Pearson et al. which propagates uncertainty into standard microarray analyses such as differential expression and the ccems package for combinatorically complex equilibrium model selection all can use snow for parallelized operations using either one of the MPI, PVM, NWS or socket protocols supported by snow. The gputools package by Buckner provides several common data-mining algorithms which are implemented using a mixture of nVidia’s CUDA langauge and cublas library. Given a computer with an nVidia GPU these functions may be substantially more efficient than native R routines. The biglm package by Lumley uses incremental computations to offers lm() and glm() functionality to data sets stored outside of R’s main memory. The bigmemory package by Kane and Emerson permits storing large objects such as matrices in memory and uses external pointer objects to refer to them. This permits transparent access from R without bumping against R’s internal memory limits. Several R processes on the same computer can also shared big memory objects. The inline package by Sklyar, Murdoch and Smith eases adding code in C, C++ or Fortran to R. It takes care of the compilation, linking and loading of embeded code segments that are stored as R strings. The Rcpp package by Eddelbuettel offers a number of C++ clases that makes transferring R objects to C++ functions (and back) easier, and the RInside package by Eddelbuettel allows easy embedding of R itself into C++ applications for faster and more direct data transfer.. The proftools package by Tierney can also be used to analyse profiling output.